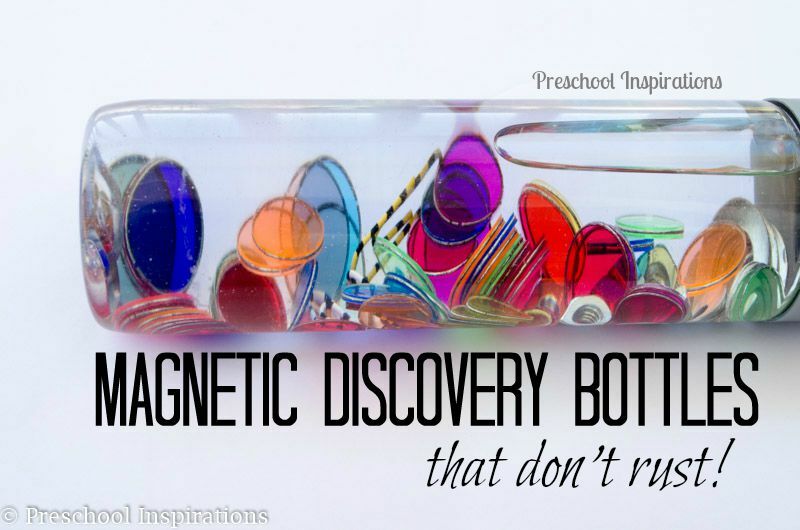 Magnetic Discovery bottles are a perfect science and sensory activity! The problem is that they rust when you add water. Thankfully, I have found a solution! Now you can make long-lasting discovery bottles that don’t rust. Here’s our new and improved no-rust magnetic discovery bottle. 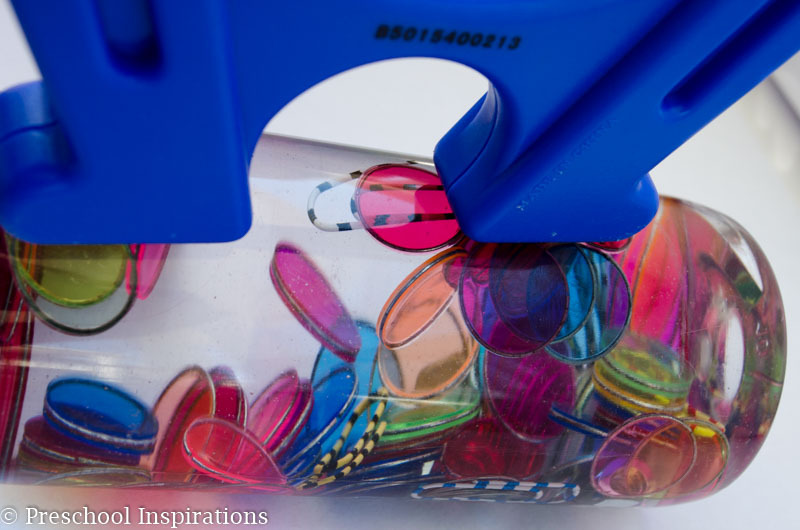 Magnetic discovery bottles are so fun because you can make the objects dance around! Then when you put a strong magnet on the outside, they come together. We can’t get enough of these really! Nuts and washers similar to the ones in this set. Mineral oil is the magic behind this bottle! When you use water, your discovery bottle will rust. However, mineral oil makes this rust-free! Just make sure there is no water in your bottle at all! You can buy mineral oil at your local grocery store. I found it for $2 on sale. Some dollar stores have it too. Baby oil can also be substituted because it’s main ingredient is mineral oil. The water bottle I am using is called a Voss plastic water bottle. Voss water bottles are available at some grocery stores, or I have even found them at TJ Maxx. But the absolute best place to find them is Amazon because they are the best price, and it is super convenient to have them delivered to your home. For magnets, I have the Super Magnet Lab because we get so many uses out of it. It includes the magnet wands and tons of other great magnets. Plus, it has this great horseshoe-shaped magnet, which is super strong and easily attracts the magnets inside. However, you could just get a magnetic wand with magnetic chips . Almost everything I put in this sensory bottle we already had around the classroom. Then super glue the lid to the bottle…just in case! These objects are all choking hazards, so it’s always a good idea to keep checking to make sure the super glue is holding. I put glue on mine about every three to six months with little ones around. 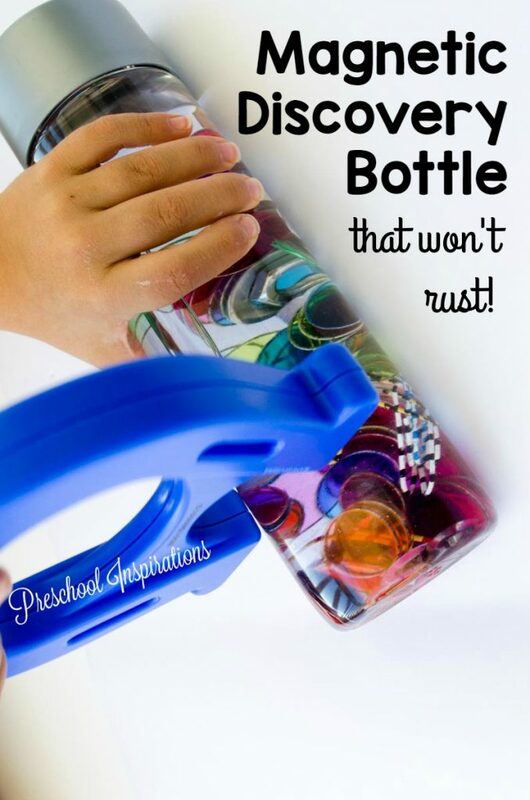 Then enjoy the magic of a no-rust magnetic discovery bottle! Here are some more of my favorites sensory bottles! Last yr my pre k did this with square plastic containers. The children loved it. We also used Styrofoam cups and places magnetic stuff inside, the children ran the magnetic wands around the cups and moved the items to the top of cups! These look great. I will make them for use in my toddler room! I love your work very inspirational. Already my children have had great fun with your sensory bottle ideas. Thanks. these look great! But curious, did you fill the entire bottle with mineral oil or only a lil bit with water? Thanks for answering in advance. Thanks for visiting, Crystal! The entire bottle has mineral oil. Even a little bit of water will rust it. I hope that helps :). another idea for rust free! use colored rice instead of water!! 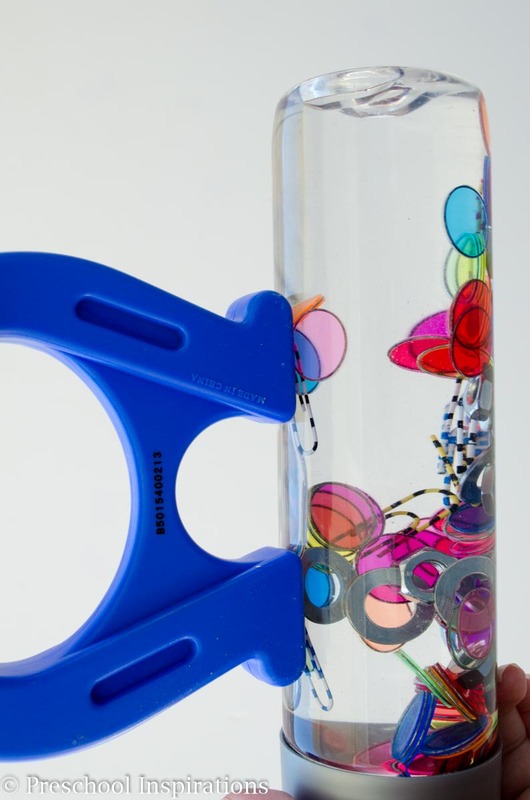 the kids can shake the bottles to “hide” the magnetic things and then use a wand to find them again! sorry no picture. 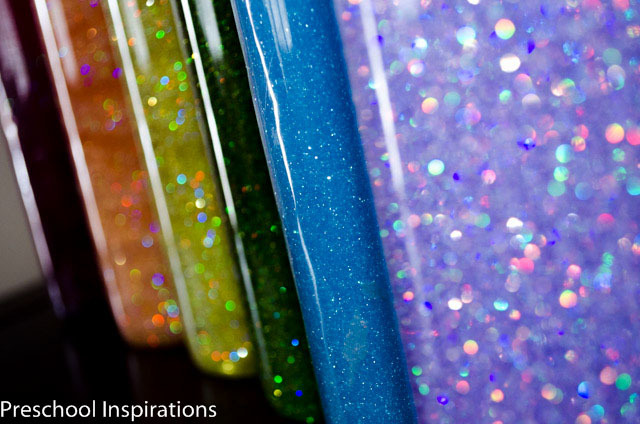 Yes, that would be a great idea for a dry ingredient sensory bottle or an I spy bottle :). Do pipe cleaners work well in the mineral oil? This looks like a fun activity! I’ve not tried pipe cleaners with mineral oil, but if you do, I’d love to hear how it goes :). I absolutely love your discovery bottles! 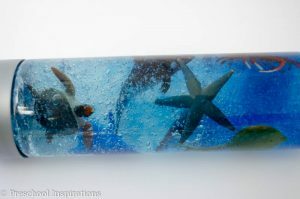 Do you think they would work with glass bottles rather than plastic? I have a couple of glass ones. I think they work well, but we work a lot on being careful with them.